"Stove Top" redirects here. For the brand of stuffing, see Stove Top stuffing. A kitchen stove, often called simply a stove or a cooker, is a kitchen appliance designed for the purpose of cooking food. Kitchen stoves rely on the application of direct heat for the cooking process and may also contain an oven, used for baking. "Cookstoves" (also called "cooking stoves" or "wood stoves") are heated by burning wood or charcoal; "gas stoves" are heated by gas; and "electric stoves" by electricity. A stove with a built-in cooktop is also called a range. In the industrialized world, as stoves replaced open fires and braziers as a source of more efficient and reliable heating, models were developed that could also be used for cooking, and these came to be known as kitchen stoves. When homes began to be heated with central heating systems, there was less need for an appliance that served as both heat source and cooker and stand-alone cookers replaced them. Cooker and stove are often used interchangeably. The fuel-burning stove is the most basic design of kitchen stove. "Nearly half of the people in the world (mainly in the developing world), burn biomass (wood, charcoal, crop residues, and dung) and coal in rudimentary cookstoves or open fires to cook their food." More fuel efficient and environmentally sound biomass cook stoves are being developed for use there. Natural gas and electric stoves are the most common today in western countries. Both are equally effective and safe, and the choice between the two is largely a matter of personal preference and pre-existing utility outlets: if a house has no gas supply, adding one just to be able to run a gas stove is an expensive endeavor. Modern kitchen stoves often have a "stovetop" or "cooktop" (American English; known as the "hob" in British English) as well as an oven. A "drop-in range" is a combination stovetop-and-oven unit that installs in a kitchen's lower cabinets flush with the countertop. Most modern stoves come in a unit with built-in extractor hoods. Professional chefs often prefer gas stovetops, for they allow them to control the heat more finely and more quickly. Today's major brands offer both gas and electric stoves, and many also offer dual-fuel ranges combining a gas stovetop and an electric oven. Early clay stoves that enclosed the fire completely, were known from the Chinese Qin Dynasty (221 BC–206/207 BC), and a similar design known as kamado (かまど) appeared in the Kofun period (3rd–6th century) in Japan. These stoves were fired by wood or charcoal through a hole in the front. In both designs, pots were placed over or hung into holes at the top of the knee-high construction. Raised kamados were developed in Japan during the Edo period (1603–1867). Prior to the 18th century in Europe, people cooked over open fires fueled by wood. In the Middle Ages, waist-high brick-and-mortar hearths and the first chimneys appeared, so that cooks no longer had to kneel or sit to tend to foods on the fire. The fire was built on top of the construction; the cooking done mainly in cauldrons hung above the fire or placed on trivets. The heat was regulated by placing the cauldron higher or lower above the fire. Open fire systems had three major disadvantages that prompted an evolutionary series of improvements from the 16th century onwards: it was dangerous, it produced much smoke, and the heat efficiency was poor. Attempts were made to enclose the fire to make better use of the heat that it generated and thus reduce the wood consumption. An early step was the fire chamber: the fire was enclosed on three sides by brick-and-mortar walls and covered by an iron plate. This technique also caused a change in the kitchenware used for cooking, for it required flat-bottomed pots instead of cauldrons. The first design that completely enclosed the fire was the 1735 Castrol stove, built by the French architect François de Cuvilliés. This stove was a masonry construction with several fireholes covered by perforated iron plates and was also known as a stew stove. 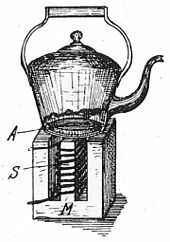 Near the end of the 18th century, the design was refined by hanging the pots in holes through the top iron plate, thus improving heat efficiency even more. The modern kitchen range was invented by Sir Benjamin Thompson, Count Rumford in the 1790s. As an active scientist and prolific inventor, he put the study of heat onto a scientific basis and developed improvements for chimneys, fireplaces and industrial furnaces, which led to his invention of the kitchen range. Section of Rumford fireplace, invented by Sir Benjamin Thompson. His Rumford fireplace created a sensation in London when he introduced the idea of restricting the chimney opening to increase the updraught. This was a much more efficient way to heat a room than earlier fireplaces. He and his workers modified fireplaces by inserting bricks into the hearth to make the side walls angled, and added a choke to the chimney to increase the speed of air going up the flue. The effect was to produce a streamlined air flow, so all the smoke would go up into the chimney rather than lingering and entering the room. It also had the effect of increasing the efficiency of the fire, and gave extra control of the rate of combustion of the fuel, whether wood or coal. Many fashionable London houses were modified to his instructions, and became free of smoke. Following on from this success, Thompson designed a kitchen range made of brick, with a cylindrical oven and holes in the top for the insertion of pots. When not needed, the opening could be covered over leaving the fire to smolder gently. This kitchen range was much more fuel efficient than the prevailing open hearth method and to a great degree safer. His range was widely adopted in large cooking establishments, including at the soup kitchens that Thompson built in Bavaria. However, it was too big and unwieldy to make much of an impact on domestic cooking. The first half of the nineteenth century witnessed a steady improvement in stove design. Cast iron stoves replaced those made of masonry and their size shrank to allow them to be incorporated into the domestic kitchen. By the 1850s, the modern kitchen, equipped with a cooking range, was a fixture of middle-class homes. In 1850 Mary Evard invented the Reliance Cook Stove, which was divided in two with one half for dry baking and the other half for moist. Patents issued to Mary Evard are US76315 and US76314 on April 7, 1868. She demonstrated this stove with her husband at the St. Louis World's Fair. A 19th-century stove made in Budapest exhibited in the Međimurje County Museum, Croatia, during the Night of Museums in 2015. In 1867 Elizabeth Hawks of New York invented and received a patent for a baking attachment for stoves, intended to spread heat thoroughly throughout loaves while keeping the top crust tender, which she called an "Auxiliary Air-chamber for Stoves." This was so successful that she sold two thousand within months of its release. Stoves of that era commonly burned charcoal as well as wood. These stoves had flat tops and the heat was concentrated on one side of the stove top so that cooks could cook things at different temperatures based on where the pot or pan was located. This was called the "piano" system. After coal was replaced with gas, French chefs continued to prefer the smooth cooking surface and so the majority of French gas stoves had flat metal surfaces over the gas burners, which continues to be known as the "French style" today. Early gas stoves produced by Windsor. From Mrs Beeton's Book of Household Management, 1904. A major improvement in fuel technology came with the advent of gas. The first gas stoves were developed as early as the 1820s, but these remained isolated experiments. James Sharp patented a gas stove in Northampton, England, in 1826 and opened a gas stove factory in 1836. His invention was marketed by the firm Smith & Philips from 1828. An important figure in the early acceptance of this new technology, was Alexis Soyer, the renowned chef at the Reform Club in London. From 1841, he converted his kitchen to consume piped gas, arguing that gas was cheaper overall because the supply could be turned off when the stove was not in use. A gas stove was shown at The Great Exhibition in London in 1851, but it was only in the 1880s that the technology became a commercial success in England. By that stage a large and reliable network for gas pipeline transport had spread over much of the country, making gas relatively cheap and efficient for domestic use. Gas stoves only became widespread on the European Continent and in the United States in the early 20th century. Drawings submitted on 29 November 1905 when David Curle Smith obtained an Australian patent (No. 4699/05) for his "electric cooking stove", also known as "The Kalgoorlie Stove". Once electric power was widely and economically available, electric stoves became a popular alternative to fuel-burning appliances. One of the earliest such devices was patented by Canadian inventor Thomas Ahearn in 1892. Ahearn and Warren Y. Soper were owners of Ottawa's Chaudiere Electric Light and Power Company. The electric stove was showcased at the Chicago World's Fair in 1893, where an electrified model kitchen was shown. Unlike the gas stove, the electrical stove was slow to catch on, partly due to the unfamiliar technology, and the need for cities and towns to be electrified. Early electric stoves were unsatisfactory due to the cost of electricity (compared with wood, coal, or city gas), limited power available from the electrical supply company, poor temperature regulation, and short life of heating elements. The invention of nichrome alloy for resistance wires improved the cost and durability of heating elements. The first practical design was patented by the Australian David Curle Smith in 1905. His device adopted (following the design of gas stoves) what later became the configuration for most electric stoves: an oven surmounted by a hotplate with a grill tray between them. Curle Smith's stove did not have a thermostat; heat was controlled by the number of the appliance’s nine elements that were switched on. The first electric stoves used heating elements made of high-resistance metal to produce heat. The stovetop (range) surface had one or more circular heating elements, insulated with compressed magnesia and sheathed in a spiral metal tube. Heating elements for the oven are of similar construction but an elongated loop to distribute heat. Elements were made as plug-in consumer-replaceable parts and could also be easily removed for cleaning. Temperature of cooking elements was regulated by adjusting a bimetal thermostat control switch, which switched power on and off to control the average heating effect of the elements. 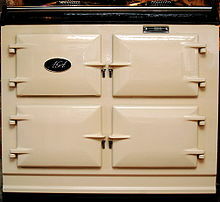 A high-end gas stove called the AGA cooker was invented in 1922 by Swedish Nobel prize winner Gustaf Dalén. As a heat storage stove, it worked on the principle that a heavy frame made from cast iron components can absorb heat from a relatively low-intensity but continuously-burning source, and the accumulated heat can then be used when needed for cooking. Dalén took his design to Britain in 1929, where it was first manufactured under licence in the early 1930s. The cast iron components were first cast at the Coalbrookdale foundry in the 1940s, where they are still made today by the Aga Rangemaster Group. Its popularity in certain parts of English society (owners of medium to large country houses) led to the coining of the term "AGA Saga" in the 1990s, referring to a genre of fiction set amongst stereotypical upper-middle-class society. Microwave ovens were developed in the 1940s, and use microwave radiation to directly heat the water held inside food. An early induction cooker patent from 1909. Rather than applying direct heat to a cooking vessel, an induction cooktop causes metal vessels to heat by electromagnetic induction. This leaves the cooking top cold (or rather, only heated by proximity to the cooking vessel) and increases efficiency. Induction cooking offers less waste heat, faster boiling times and the ability to set cookware anywhere on the surface of the stovetop. Although it does require cookware that’s made with some iron or is magnetic, to allow the induction to take place. The first patents date from the early 1900s. Demonstration stoves were shown by the Frigidaire division of General Motors in the mid-1950s on a touring GM showcase in North America. The induction cooker was shown heating a pot of water with a newspaper placed between the stove and the pot, to demonstrate the convenience and safety. This unit, however, was never put into production. Modern implementation in the USA dates from the early 1970s, with work done at the Research & Development Center of Westinghouse Electric Corporation at Churchill Borough, near Pittsburgh. Flattop grills are also being installed into kitchen counters and islands, which do double-duty as a direct cooking surface as well as a platform for heating pots and pans. A hot plate is a similar device, which is mobile and can be used as an appropriate technology. ^ "Definition of stove - appliance, cookery and building". Oxford University Press. Retrieved 28 March 2012. ^ a b Montagne, Prosper New Larousse Gastronomique Hamlin Publishing Group 1977 268,901 Quoting Eugène Viollet-le-Duc on cooking in the Middle Ages: "The division of stoves into several compartments as in our day was seldom seen. The dishes were cooked on the fire itself, and these fierce fires did not allow for dishes which required constant stirring, or to be made in frying pans". ^ "Clean Cookstove Research - Air Research - Research Priorities - Research - US EPA". archive.org. 2 February 2013. Retrieved 14 April 2018. ^ Suzanne Staubach (2013). Clay: The History and Evolution of Humankind's Relationship with Earth's Most Primal Element. UPNE. ^ "evard". google.com. Retrieved 14 April 2018. ^ "Improvement in broiling-apparatus". google.com. Retrieved 14 April 2018. ^ a b Snodgrass, Mary Ellen (29 November 2004). "Ency Kitchen History". Taylor & Francis. Retrieved 14 April 2018 – via Google Books. ^ MacDonald, Anne L. (15 December 2010). "Feminine Ingenuity: How Women Inventors Changed America". Random House Publishing Group. Retrieved 14 April 2018 – via Google Books. ^ Zipf, Catherine W. (14 April 2018). "Professional Pursuits: Women and the American Arts and Crafts Movement". Univ. of Tennessee Press. Retrieved 14 April 2018 – via Google Books. ^ Mary Ellen Snodgrass (2004). Encyclopedia of Kitchen History. Routledge. p. 428. ^ "Patent no. 39916". Made in Canada. Library and Archives Canada. November 22, 2005. Retrieved October 19, 2011. ^ "Early Electric Cooking: 1900 to 1920". Canada Science and Technology Museum. Retrieved October 19, 2011. ^ "Induction Cooktops". Appliance Help. Archived from the original on 2013-05-15. Retrieved 2013-05-30.